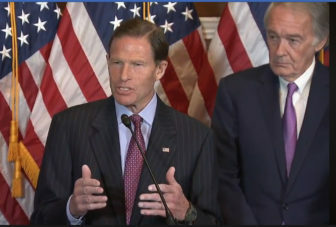 Washington – Sen. Richard Blumenthal on Monday joined other Democrats in assailing Supreme court nominee Brett Kavanaugh for suggesting, years ago, that justices were wrong in deciding former President Richard Nixon had to obey a subpoena to turn over the Watergate tapes. “If Kavanaugh would have let Nixon off the hook, what would he do for President Trump?” asked Senate Minority Leader Charles Schumer, D-N.Y.
Democrats have also seized on Kavanaugh’s dislike of a federal law that set up the independent counsel’s office to investigate and prosecute government officials for violating federal criminal laws. That law was challenged as a violation of the separation of powers, but it was upheld in the Supreme Court’s 1988 Morrison v. Olson 7-1 ruling. In a video from 1988 unearthed by CNN, Kavanaugh, however, said “I’d put the final nail” in the law. The independent counsel law expired in 1999 and the responsibility of appointing special counsels became regulated by the Department of Justice, which tasked Mueller to investigate Russian interference in the 2016 U.S. election. “Kavanaugh has argued the president has the right to fire the special counsel,” Blumenthal said. Kavanaugh’s supporters, however, make the distinction between the independent counsel law, which failed to garner enough support in Congress to be renewed, and the current method of appointing special counsels.